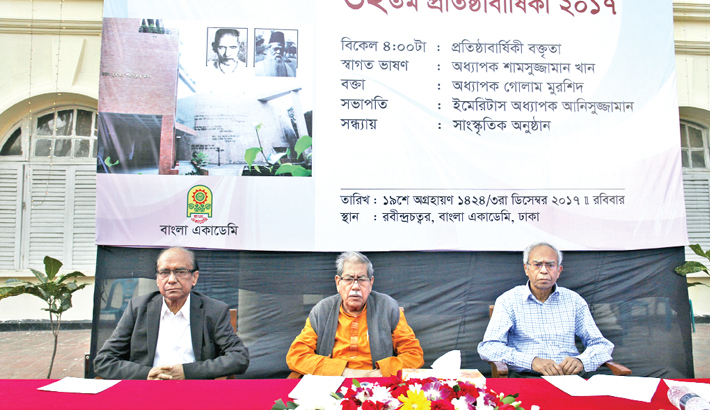 Bangla Academy on Sunday celebrated its 62nd founding anniversary with much enthusiasm with various programmes. Marking the anniversary, Bangla Academy has chalked out elaborate programmes. The programmes began at 10:00am on Sunday with the placing of wreaths at Central Shaheed Minar. A discussion programme followed by a cultural function was held at Rabindra Chattar of the academy. Prof Golam Murshid was present the keynote speech at the discussion programme. Bangla Academy President Professor Emirates of Dhaka University Dr Anisuzzaman was preside over the programme, while it’s DG Prof Shamsuzzaman Khan was deliver the welcome speech. At the beginning of the ceremony, one minute silence was observed standing in honor of the memory of Dhaka North City Corporation Mayor Annisul Huq. On the occasion, Artists Laisa Ahmed Lisa and Kamalika Chakraborty were performed at the cultural program. The Bangla Academy began its journey on December 3, 1955. Chief Minister of the then East Bengal Abu Hossain Sarker inaugurated the academy. Then Education Minister of East Bangla Ashrafuddin also addressed the function held at Battola of the erstwhile Bardhaman House. The Bangla Academy had started its activities with four sections, which were expanded to six by the preparatory committee in its 10th meeting on May 18, 1957. The sections were research, translation, compilation, publications and sales, culture and library. The then President of independent Bangladesh promulgated the Bangla Academy Order 1972 on May 17, 1972 and then the Central Board for Development of Bengali was merged with the academy after the country's independence. The number of its sections was increased to 10 by 1983 as finance and planning, establishment, folklore and textbook sections were added to the existing ones. The Academy's main task is to conduct research on Bangla language, culture, and history, and publish Bangla literary and research works. It organises the month-long Ekushey Book Fair, the biggest book fair of the country, commemorating the Language Movement and its martyrs.